Hurray, it’s October again! Definitely the best month of the year and time to start thinking about decorating your house for Halloween. The Uk has been quite slow to catch up with truly scary outdoor Halloween decorations like the ones that have been available in the states for years, but the choice is growing every year and there’s now plenty of choice if you want to turn your front garden into a graveyard or turn your home into a haunted house for the evening. 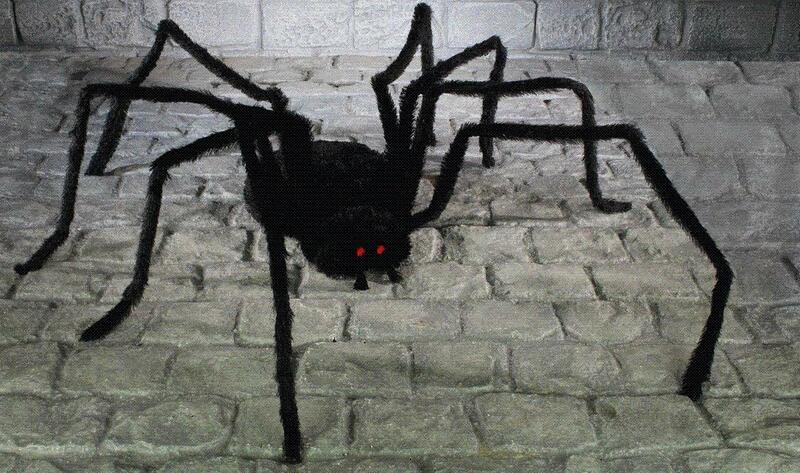 Most people are freaked out by spiders, especially GIANT spiders, so imagine how terrified your halloween party guests and trick-or-treaters will be when they see this realistic giant spider on the wall of your house. The spider is a massive 2m wide! Of course you’ll need some giant cobwebs to go with your giant spiders and this durable cotton spider web is ideal for decorating the outside of your house – it even glows in the dark! 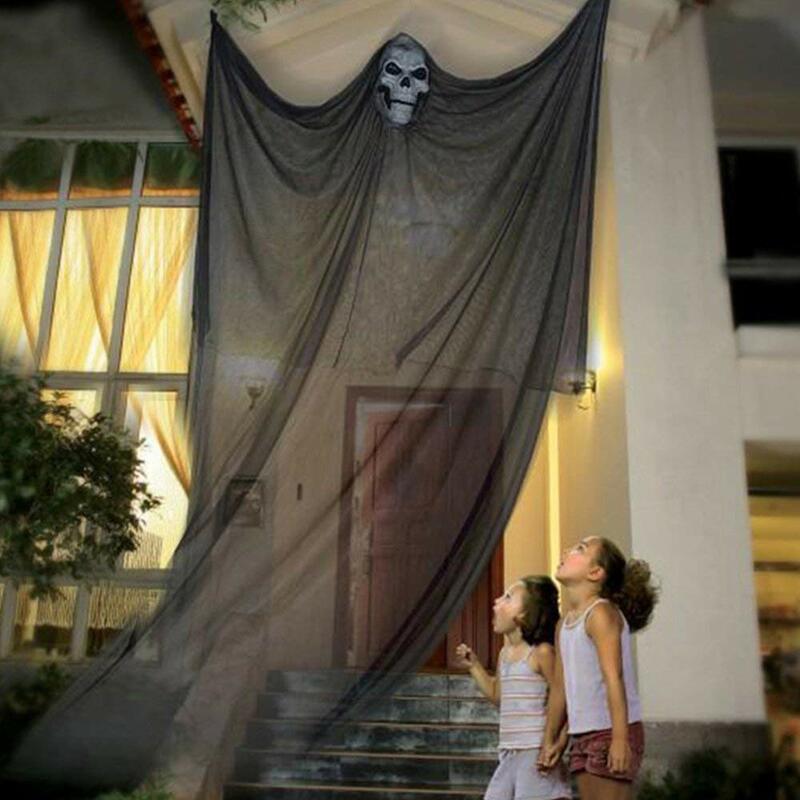 This simple but very effective and scary outdoor Halloween decoration looks amazing when hung on the front of your house so that guests have to pass under it to get to your front door. This hanging decoration is 7 ft tall, easy to install and incredibly effective with its long flowing fabric. Imagine having real ghosts flying around your house on Halloween! Well this is the next best thing and is really one of the most impressive outdoor Halloween decorations that I’ve seen this year. It consists of a weatherproof LED projector that moves automatically and has a number of interchangeable lenses to project pictures all around your house and garden. As well as the Halloween theme, there are several other lenses to choose from that are suitable for Christmas, summer, autumn, valentine’s day, birthdays and many other occasions. In fact there are 22 lenses to choose from. Perfect for any kind of party at home and you can also use this projector inside of course. The system comes with a 6-hour daily automatically repeating timer and a super-long 16.4 ft cable so it shouldn’t be a problem reaching the nearest power supply, wherever you want to place the projector. Want to make an impact on trick-or-treaters or guests arriving to your halloween party? 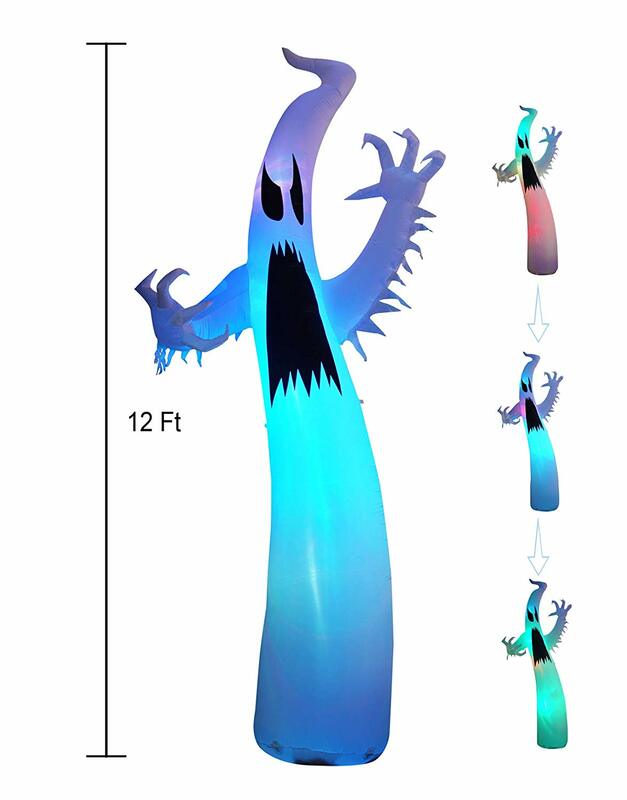 This 12ft tall inflatable outdoor ghost lantern is certainly eye-catching and looks really effective with its colour-changing LED lights. 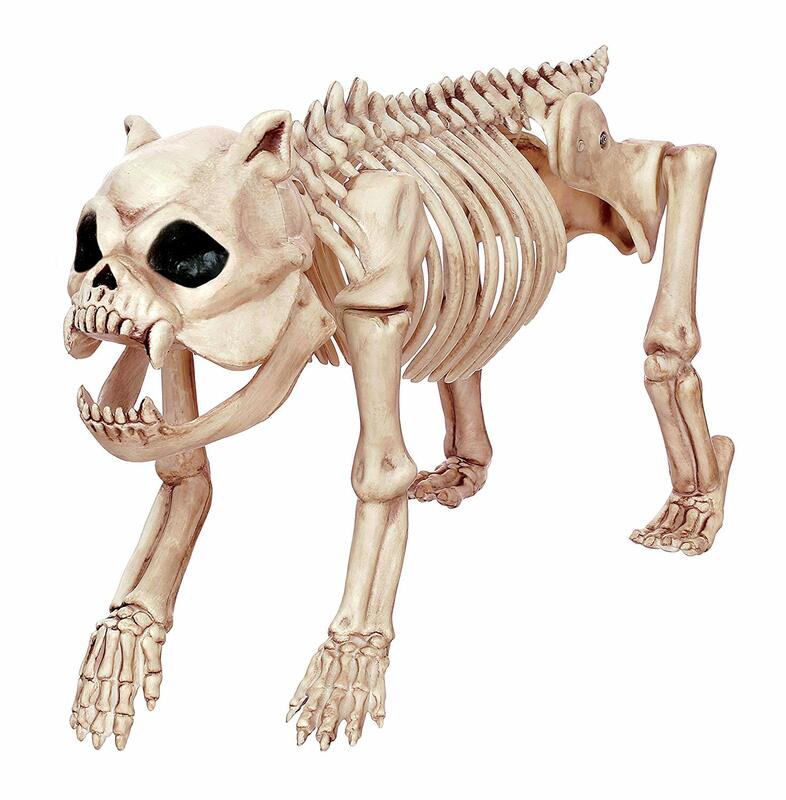 If normal human skeletons are a bit boring for your taste, you might want to decorate your garden with this realistic looking skeleton dog. This 16.5 inch spooky Halloween prop is suitable for all weathers as it’s made of durable plastic and comes as part of a range so you can get him a skeleton cat or raven as a friend if you wish. There’s nothing more easy and effective than adding a few tombstones into your garden to make it into a makeshift graveyard. These headstones are made from polyfoam but they look incredibly realistic. Just add a freshly dug ‘grave’ for full impact. 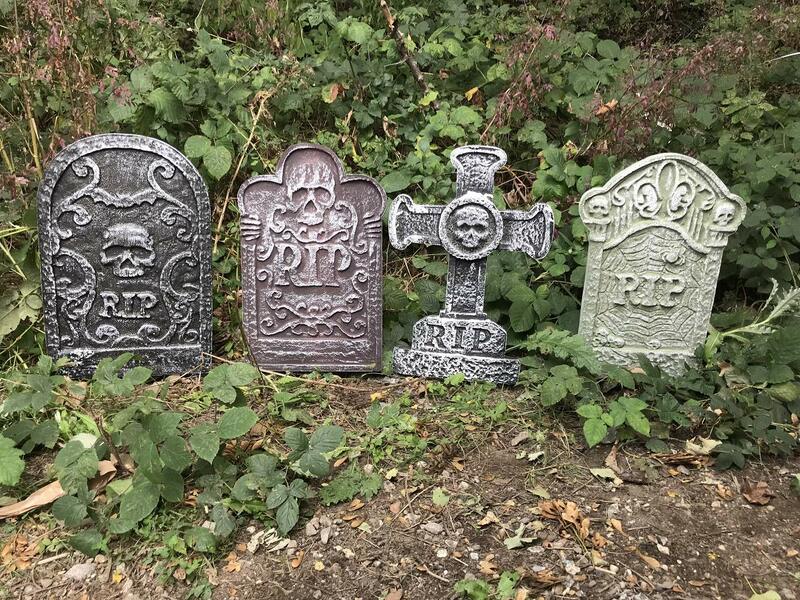 This set of 4 tombstones is great value for money and you’ll get 4 different designs to scare your neighbours with. Now this is something that will really impress the trick-or-treaters when they come calling,especially if you add a few other witchy accessories like a broomstick and black cat and of course come to the door in a great witch costume! 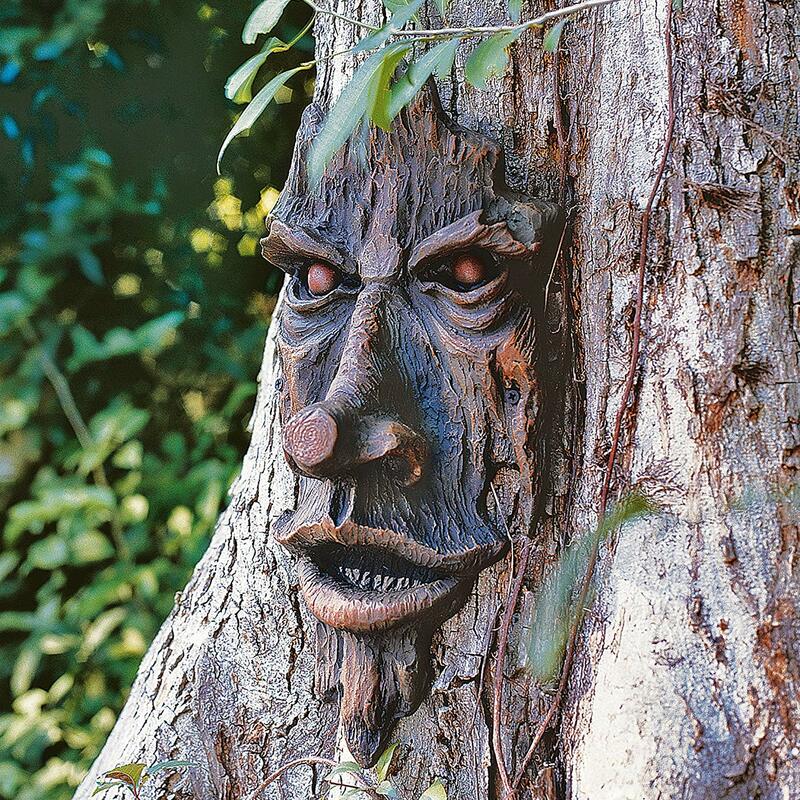 This sculpture is something you could really have fun with all year round if you have a bit of a dark sense of humour or gothic taste – just put it in your garden and watch your guests do a double-take. 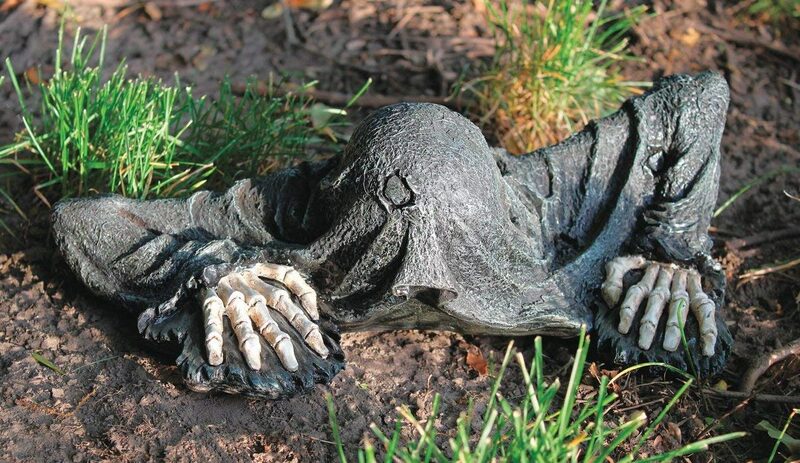 This creepy statue looks like he’s clawing his way out of the ground and makes a great outside Halloween decoration. Another spooky sculpture that makes a great finishing touch to your outdoor decorations and could be left out all year. Cast from crushed stone and resin, it looks just like the bark on a tree and is pliable so it can be wrapped around a tree trunk easily. Not too scary but a bit of a novelty that will definitely get people talking! You don’t need to put a huge amount of effort into decorating the outside of your house for Halloween – a few well chosen props can be very effective. 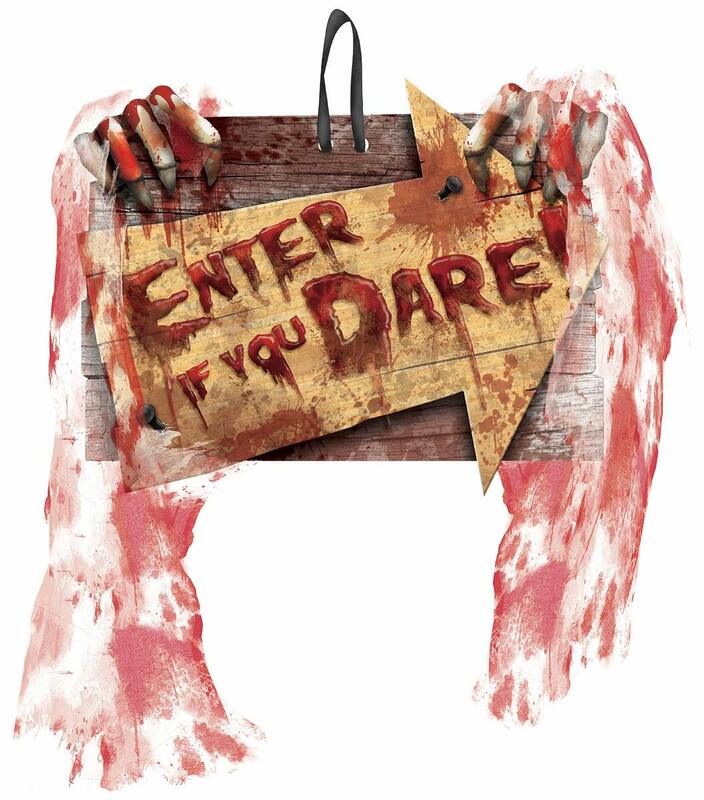 This terrifying sign is a great example and is a great price so if you’re on a budget for your decorations, you’ll be happy to know you can still get a really scary and effective look without breaking the bank. The bloody gauze attached to the sign really makes it in my opinion! You’ve still got a few days left if you haven’t sorted your Halloween costumes or decoration so don’t panic if you’re planning a Halloween party this weekend and have left things until the last minute. Most online shops offer next day delivery so you’ve not left it too late but now is definitely the time to get shopping! I was browsing one of my favourite online shops, Not On The High Street that sells some of the most unique homewares from independent designers and noticed they have an amazing Halloween section! So if you’ve not done your Halloween shopping yet, this is a great place to head. Even better, they’re offering a 15% discount on orders over £50 – just enter the code LUCKYME at checkout. Ok onto the fun Halloween shopping! This colourful bunting makes a gorgeous alternative Halloween decoration if you want to get into the party spirit without being too scary or cheesy. See full details at Not On The High Street. It’s the little details that really make your Halloween party – like using these skeleton paper cups instead of plain white or plastic versions. Comes as a set of 8 and matching paper plates and napkins are available too. See full details at Not On The High Street. Lighting can make a huge difference to your Halloween decor and these atmospheric and artistic paper bag lanterns would look great on your food table or at the entrance to your home. These bags are made from flameproof paper and can be used with tea light candles, but battery-powered LED tealights are recommended. See full details at Not on The High Street. Photobooths where your guests can have their photos taken and see them on social media later have become very popular at all kinds of parties in recent years. These are always more fun when you supply a few props and this set of Halloween themed props are sure to be entertaining at your Halloween party. See Not On The High Street for full details. This is no cheap teapot, so probably not worth buying just for using at a Halloween party, but if you love Gothic style and homewares that are a little unusual, it will make a beautifully creepy addition to your home. See Not On The High Street for full details. These spider straws will finish off your Halloween drinks with style and spookiness and kids think they’re a riot! See the full details and order at Not On The High Street. Sometimes you need to really splash out and treat yourself and this spooky drinking set would be perfect for an adult Halloween party or to display and use as part of a Gothic tableware collection. See details and buy at Not On The High Street. If you’re on more of a budget you can still serve up impressive looking drinks with the help of these spooky graveyard bottle labels. Coke becomes “bat’s blood”, wine becomes “zombie juice” or “poison” and why not serve up some “devil’s brew” instead of beer. These are fantastic for both adult and kids Halloween parties and really add to the overall decor and ambience. Buy from Not on The High Street. This gorgeous and sophisticated Halloween banner would look great as a backdrop or in your entry way and is a subtle way to add some Halloween decoration that isn’t too gory or scary. See full details at Not on The High Street. Can you believe it’s already been 10 years since the first Twilight book has come out? Stephenie Meyer just released a new edition of the book that comes with another book: Life and Death, which is basically Twilight re-written with all the genders of the characters changed. So Bella becomes Beaufort and Edward becomes Edythe. Apart from a few more names that are even more ridiculous than Renesmee, the story is exactly the same. As Halloween is fast approaching and Twilight characters are always popular characters for dressing up, I’ve compiled this list of some really detailed replica jewellery and other accessories that are just the same as the ones worn by the characters in the movies. These make great accessories for Halloween outfits or if you’re a Twilight fan, you’ll probably enjoy wearing them all through the year. They also make great gifts for fans of the series. Here it is! The ring that has girls all over the world swooning at the thought that they could be marrying Edward Cullen. This silver engagement ring set with cubic zirconia stones is an exact replica of the one Edward gives Bella in the Eclipse movie! A must-have for die-hard Twilight fans. This necklace looks just like the one Rosalie wears in the first movie with a pendant featuring the Cullen family crest. It’s made by NECA, which is the company who made the actual pieces for the movie, so you know you’re getting the real thing! When Bella is accepted as part of the Cullen family, she receives this crest ring. Bella is seen wearing this ring in the New Moon movie when Alice sees a vision of her as a vampire. Every member of the Cullen family wears an item of crest jewellery so this is an important token to show she’s been accepted. This fabric bracelet is a replica of the one that Jacob gives Renesmee for Christmas and would also make a great xmas gift for you or a friend! This leather wrist cuff is Edwards version of the crest jewellery that every member of the Cullen family wears (this cuff is also worn by Jasper and Emmett and Bella wears a female version of it). It’s a great gift for Twilight collectors or just for accessorising an outfit. Now this one is a good accessory for Halloween! This replica necklace looks just like the one the Volturi wear in New Moon. Just add a black cape and you have a great Halloween costume. Did you know there was a Twilight perfume? I did not – obviously I am not a big enough fan. If you want to smell like Bella (the scent that is completely irresistible to vampires!) this is what you need. I’m not sure it’s too safe to wear on Halloween with all those vampires around though… All joking aside, this is not a cheap perfume – it smells very nice and is a great addition to any Twilight collection. The perfume is based on the description of Bella’s scent by Edward in the book – top notes of citrus and chamomile with heart notes of white freesia and peony, and base notes of oriental patchouli, amber and musk. As much thought has gone into the bottle as creating the scent – the glass is designed to be a representation of the look and feel of vampire skin. Ok obviously not jewellery but I had to include these! Edward’s looking his usual moody self and Bella is styled as she was straight after her vampire transformation – complete with leather jacket and sparkly skin. These are official Barbie dolls and I’m actually pretty impressed at how much they look like the characters in the movie. You can also get Bella in her wedding dress and the whole family of Cullens, along with Jacob and all the other major characters. See all the Twilight Barbies here. Halloween night is less than two weeks away so now is the time to stock up on trick or treat sweets and candy to hand out on the big night. You could just be like everybody else and give out lollipops and haribo but if you want to be a little different, there are some really cool and unusual options for Halloween sweets this year. These are no ordinary lollipops – just bend the stick to make it glow in the dark. Kids love anything that glows in the dark and they’re extra fun at Halloween. Halloween sweets don’t have to be gross or scary. These chocolate frogs, just like the ones Harry ate on the way to Hogwarts, are actually rather sweet and come with a wizard trading card. You no longer have to wait until Easter to enjoy Cadbury Creme eggs! These ‘screme’ eggs taste just the same but they have a green middle, making them a spooky treat for Halloween. Another great Halloween treat from Cadbury.These chocolate spiders have green crunchy bits, look amazing and taste delicious. These ‘hazardously sour’ sweets are great to put in Halloween gift bags or give out to trick or treaters. These fruit flavour lollipops include a selection of edible bugs including ants, a worm, scorpion and cricket. Perfect for freaking out trick or treaters! This fudge is just like normal fudge – it tastes delicious but has added worms! Give this out on Halloween night and they probably won’t even notice the worms in the dark until they get home! These pastel chocolates with edible glitter are almost too pretty to eat! They’re made from Belgian chocolate and provide a delicious and luxurious treat for only your favourite trick or treaters. Get them from Not on The High Street. Another Uk Pumpkin Shortage for 2015? Posted on October 20, 2015 Leave a comment on Another Uk Pumpkin Shortage for 2015? As I mentioned in the jack-o-lantern carving post, there was a nationwide shortage of pumpkins last year, causing many kids to be disappointed in the run-up to Halloween. Well, according to news hot off the press, we’re in for another pumpkin shortage this year due to heavy rain in August which damaged the crops. In fact the supply of pumpkins this year is only about half the usual yield. Although pumpkins suppliers have said this year that they hope to meet demand, it probably means that pumpkins in supermarkets will be a little more expensive this year. Most pumpkins are sold in the week before Halloween so don’t panic if you haven’t got yours yet but it might be a good idea to get them before the price goes up! The cheapest pumpkins around this year are currently at Morrisons for only 50p per pumpkin and they should be fine until Halloween night as long as you keep them in a cool dark place and don’t carve them until the day before. So get your cheap pumpkins while you can! If you’re one of those people who stock up on things while they’re cheap, you might end up with a few extra pumpkins. So what to do with all that pumpkin leftover from carving? Get cooking! It’s the little details that really make a great Halloween costume. Even a plain black dress can look incredibly scary and spooky if you spend time getting your makeup right and accessorise with some of this Halloween themed jewellery. All these Halloween earrings, bracelets and necklaces are made of good quality materials so they don’t look cheap and tacky. In fact you could wear them at any time of year if you tend towards the dark side of fashion and look great with gothic outfits or out clubbing. A subtly scary and beautiful silver bangle with skulls on each end. Ideal to accessorise gothic or Halloween outfits. This colourful and quirky bracelet is great to wear at any time of the year, not just Halloween. Makes a great Halloween souvenir for kids or teenagers. This is a great men’s Halloween accessory if you’re attending a sophisticated Halloween party or need to dress formally for work but want to inject a bit of spooky fun in a subtle way. No vampire can be without their emergency supply of blood and this bat blood necklace makes an ideal Halloween accessory for a vampire costume. Also includes a silver bat charm and the ‘blood’ is actually resin so no need to worry about it leaking! A bit of bling for girly vampire lovers. This necklace features a pair of red lips with sparkly piercing and gold fangs. If you or a friend collects Pandora charms, you just have to buy this cute little ghost Halloween charm. It’s made from .925 sterling silver and designed to be compatible with Pandora bracelets and other similar charm bracelets such as Chamilia, Biagi and Trollbeads. Another cute Halloween Pandora charm which could be mixed with other Halloween-themed charms for a Halloween bracelet or just mixed with any other charms. It’s made from .925 sterling silver and makes a great present for a friend who loves Halloween! Ok, not strictly jewellery but I had to include these Halloween Day of The Dead Sugar. They are so cute and cheap and would make great little party gifts or goodies for trick or treaters. I love these cute cat earrings. They’re great for Halloween but don’t look too costume-ish or gothic so you could wear them with any outfit at any time of the year. Suitable for adults or kids with pierced ears. Earrings measure about 10mm across. These spiderweb earrings are obviously great for Halloween and would look perfect with a witch costume, but they’re also stylish enough to be worn at any time of the year. They’re great quality, made from 925 sterling silver and come in a little gift box so they’d also be great to give as a gift. This elegant gothic wrist piece looks so delicate and detailed, I really can’t believe how cheap it is. It would make the ideal accessory for a vampire costume or dress up any gothic outfit. What girl doesn’t want to be Bella for Halloween? That is Bella Cullen from Breaking Dawn Part 2, after she’s been turned into a vampire! This wrist cuff is an exact replica of the one Bella wears in the movie and is a perfect Halloween accessory for a Twilight Bella dressing up costume. I’m sure you know a vampire lover who would happily wear this necklace on every day of the year, not just at Halloween. It makes the perfect accessory for a vampire costume or just as everyday jewellery with a gothic vibe. There’s something really scary about this topaz ring from cult gothic designer jewellery Brand Violet Darkling. Plated in black rhodium, this ring would make an extra special gift for a gothic lady in your life. There is really something hypnotic about this ring – the more I look at it, the more I want it! See other Violet Darkling designer jewellery pieces here. This beautiful and elegant gothic neckpiece is just the thing to finish off a sophisticated vampire outfit (wear it with the cuff/bracelet earlier in this list and the gothic vampire queen gown on this page. You won’t believe how cheap this necklace is – just click the button above and have a look! It looks really expensive but is actually a super cheap way to accessorise any dress and make it look really gothic and amazing. Ok hands up if you’re a fan of the Twilight series! Twilight character costumes are really easy to pull off because they basically wear normal clothes and the look is all in the makeup and the details like this replica necklace that is exactly like the one Rosalie wears in the movie Breaking Dawn. I‘ve titled these as men’s earrings but of course they’re unisex and would look great with any Halloween outfit or gothic look. They’re made from stainless steel and are proper piercing jewellery so suitable to wear on any part of the body with the correct gauge. This cute ring makes a great gift around Halloween time, maybe if you know a little girl with a birthday around Halloween, like my daughter! It’s adjustable size and fits from E up. Made of 925 sterling silver, it comes in a gift box. I think this bracelet is one of my favourite pieces in this whole list. I love that it’s so colourful and would make an eyecatching and quirky accessory at any time of the year. It’s also great for kids and really cheap – I think I’ll be giving these out as treats to trick or treaters this year! (p.s. these are being sold for 10x the price in certain highstreet fashion shops!) The beads aren’t plastic, they’re actually made out of stones. It’s a really unique and fun bracelet for kids or adults. This is a gorgeous statement necklace that could be worn any time of the year but the fact that it’s a skull makes it great for accessorising any outfit at Halloween! The pendant measures approximately 3 inches by 2.5 inches and the chain is 70cm long in a twisted rope style. This skull pendant is amazing value for money and great quality for the price. Using makeup can be a really effective and cost-effective way of creating a scary Halloween costume. 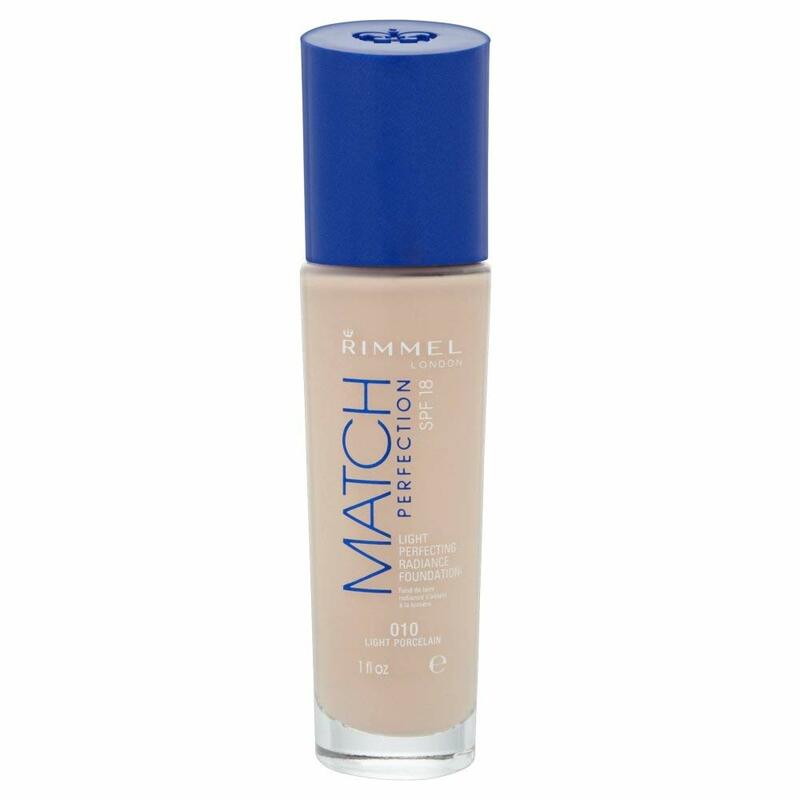 However many of the looks showcased by popular beauty and special fx makeup artists use lots of different makeup that can be quite expensive if you end up buying all of it. The Japanese do horror films really well and a costume based off one of the scary ghosts in a movie like The Grudge is sure to freak people out and impress your friends this Halloween. This is one of the easiest Halloween fancy dress ideas out there – you can simply wrap yourself in a white sheet! If you don’t have long black hair then you’ll need a wig, but what really makes this look is the makeup. A skeleton is another really easy costume to create. You can either paint bones onto a tight fitting black t-shirt and leggings or just buy a Halloween onesie with a skeleton theme if you’re feeling lazy. This kit includes glow in the dark facepaint which makes your look even scarier, particularly if you jump out at somebody in the dark! This one terrifies me because I have a real phobia of clowns! Never mind killer clowns, normal old clowns are scary enough! 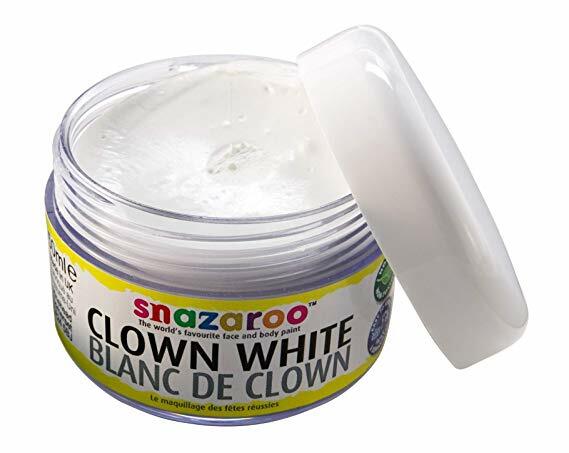 Clown makeup is pretty easy to do so this is a good choice of kit if you don’t find yourself very skilled in the application. The look is really made by the scary teeth and fake blood. A broken or creepy doll has become a very popular fancy dress theme for Halloween, probably because it looks a lot prettier and sexier than most Halloween costumes so you can look scary without sacrificing your attractiveness. There’s a great costume to go with this look on our list of Halloween costumes for women. The Joker has always been a popular outfit for Halloween and since Heath Ledger tragically died in the middle of filming his role of The Joker in the Batman film The Dark Knight, it has become even more so. The zipper face effect has become a very popular Halloween makeup look which looks really impressive and scary when done right. 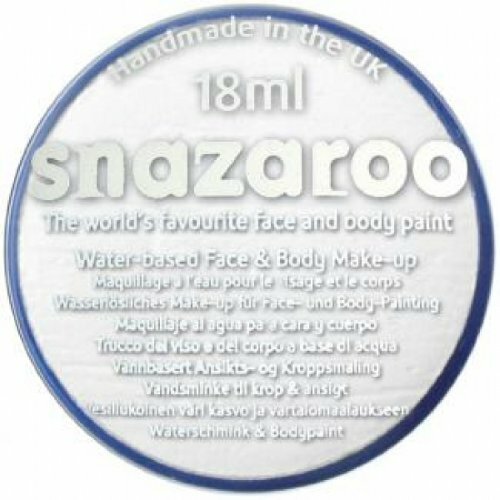 It’s also versatile and easy to personalise as you can makeup your face however you want under the zipper – zombie, vampire and werewolf are all popular options. 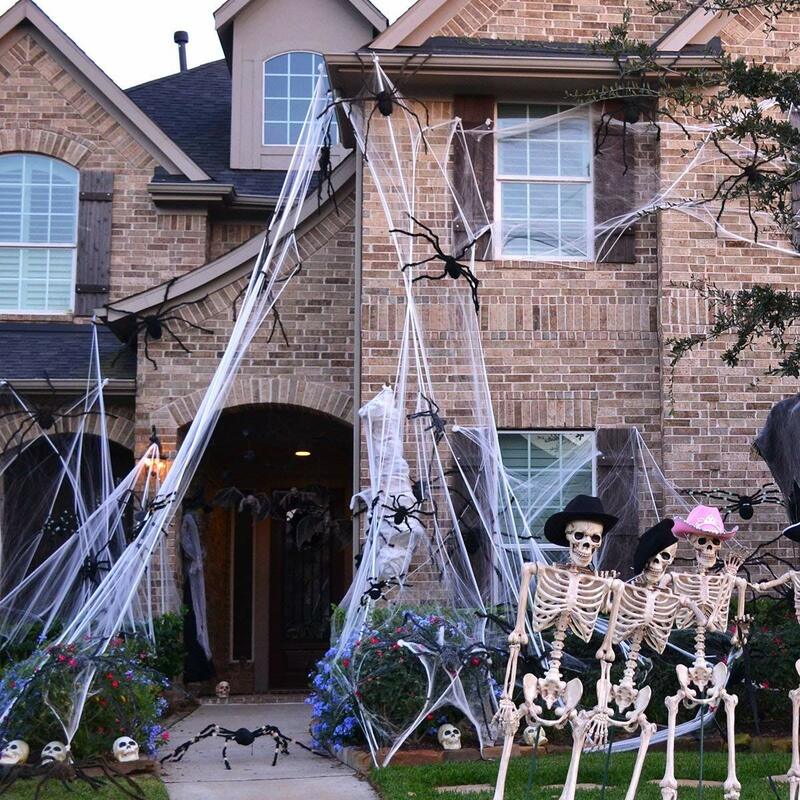 Decorating your house with scary Halloween props can certainly make for a spooky party, but if you really want to scare your guests, consider going that little bit further and using the help of some special effects to turn your home into something straight out of a horror movie. 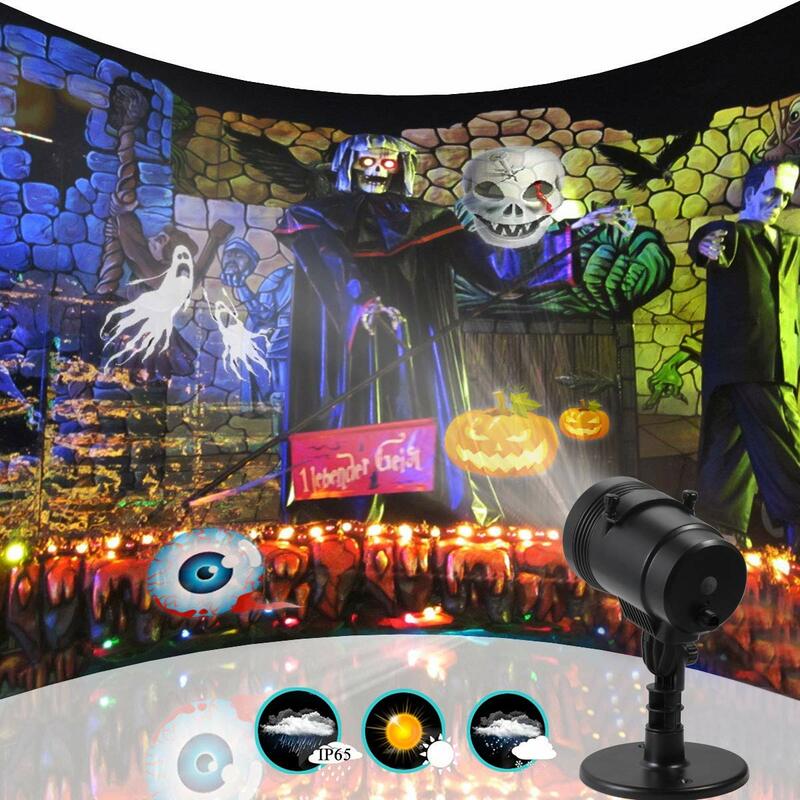 Gear like fog machines, black lights and strobe lights are now much more affordable so you don’t have to break the budget to create a really impressive atmosphere at your Halloween party. Even something as simple as playing a spooky Halloween soundtrack can make a world of difference to the scary feeling and make sure your guests have a night to remember! Creating a spooky fog is probably one of the most effective ways you can create a scary atmosphere. Why is fog so scary? Maybe because we associate it with outdoor places like graveyards and old castles in the dead of night. Or maybe because it hides what might be lurking underneath. Fog machines can be used indoors and outdoors and work best in low lighting, they can really help to make your Halloween props look real. This 1Byone fog machine is really affordable and is one of the bestsellers on Amazon. It creates a thick fog which is enough to fill a room the size of two garages. You can also change the density to produce a thicker or thinner fog. The best thing about this machine however is that it comes with a remote control so you can hide it behind a spooky prop in the garden and give trick-or-treaters the fright of their life when they come knocking on your door! All fog machines need fog fluid so don’t forget it when you order your machine. 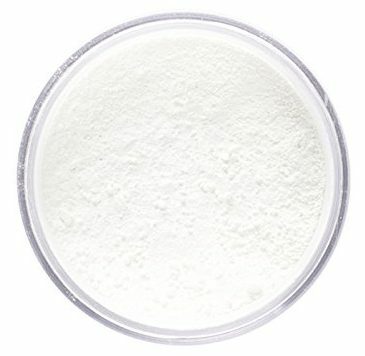 This 1 litre bottle of QTX fog fluid is very cheap, produces great fog, and it’s non-toxic. Strobe lights are great fun at any nighttime party but add an extra dimension of spookiness at a Halloween party and work particularly well when used in conjunction with a smoke machine. Of course it’s important to remember that strobe lights can cause fits in people with epilepsy so you should always make sure none of your guests are affected by this kind of lighting and only use it for short periods at a time. This particular strobe light costs less than a tenner so you could easily buy a couple of them to create special effects at your Halloween party. 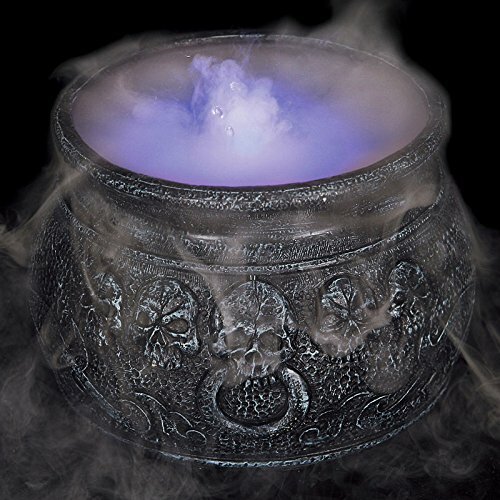 They look great with a fog machine if you’ve set up a graveyard outside your house, creating a spooky flickering light. You could also set one up in an upstairs window behind a scary mummy or other figure to terrify guests and trick-or-treaters coming to your house! Black lights, also known as UV lights, make white and fluorescent objects glow in the dark. These are always great fun at parties and especially so at Halloween when you can plan your costume to look extra amazing under UV light or set up props like skeletons that will glow brightly in the dark room. You can buy black light lightbulbs that go in your normal light fittings but they don’t work very well – you’re better off buying a fluorescent tube blacklight like this one that can be plugged in and put wherever you like in the room. If you’re getting a black light, remember to have some fun with it! Black light paints like these can be used to paint on your walls or on Halloween decoration to create a vivid bright neon effect when the UV light is turned on. You can also use UV body paints like these ones to create some amazing special Halloween makeup effects in the dark or even just a simple costume – what could be easier than painting a skeleton onto a black tight fitting outfit? Ok bubbles aren’t terribly scary! But they’re great for kids Halloween parties and they also look great with your Halloween special fx lighting. You can even use UV glow in the dark bubble fluid so that they glow under the black light! You can buy professional quality bubble machines but a small one like this is enough for a party at home and cheap enough that you won’t think twice about buying one. You can use batteries with this to put it in awkward corners, or you can plug it into the mains. It comes with a small bottle of bubble liquid but you’ll probably want to buy a bigger one if you plan on blowing bubbles for hours. 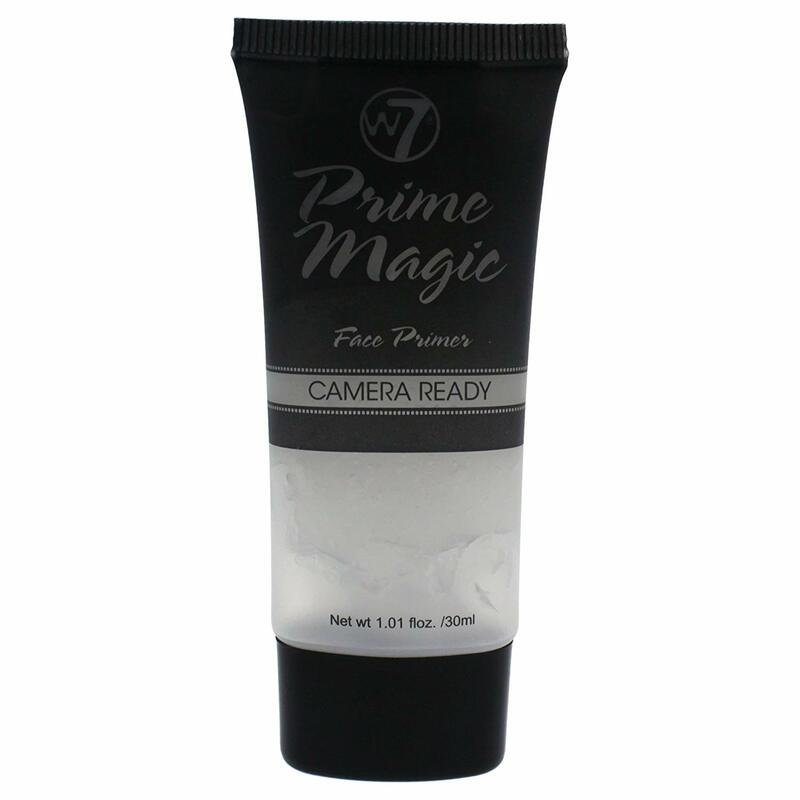 For maximum fun in the dark, be sure to buy some UV bubble fluid which will create magical spooky bubbles that glow under a black light.